When a student comes into the classroom, he does not come alone; he brings his family with him, however "normal" or "abnormal" that family may be by the school's standards (e.g., Couchenour & Chrisman, 1999). Therefore, it is important that all those who work with a particular student know his family circumstances. Research shows that the more family involvement with the school, the better that student does in school (eg., White-Clark & Decker, 1996; Ballen & Molles, 1994). As a result, many school systems are implementing programs that encourage family participation in school life (Columbia Teachers College, 1995). According to Websters New World College Dictionary (1997), the definition of the traditional family is the second definition, not the first. This definition states, "all of the people living in the house;" household." Unlike previous years, todays family does not necessarily consist of two parents and their biological children, with the father going to work and the mother staying at home to raise the children. In fact, it is more unusual for this type of family situation to exist in todays society than not (McCarthy, 1992). Children today may be raised by single parents, grandparents, aunts, uncles, non-married heterosexual couples, and non-married homosexual couples. There are also those who are being raised by siblings or in foster care. Children of divorced parents may also have different living arrangements (e.g., a child may live with one parent part of the week or month, and the other parent for the other part of the week or month.) All these factors must be considered when teaching a child and interacting with the family. There are some questions to consider, which at one time we would not have considered (e.g., who is to sign report cards, who does one call for a parent conference.) This may be particular difficult in shared custody agreements or in foster care situations. There are also those high school students who are married or live independently of their parents or guardians. Who signs the report cards? Who writes the absentee excuses? These may seem to be simple questions, but unless there is a policy set at the beginning of the school year, there can be many difficulties arising from these circumstances. In todays school, a classroom may be filled with students from many different cultures (Burnett, 1994) (e.g., Caucasian, African-American [Schwartz, 1995], Asian [Huang, 1993; Schwartz, 1994], Hispanic [Inger, 1992; Espinosa, 1995], etc.) Each of these different cultures bring with them different ideas on education and the family. If one does not become sensitive to these differences, it will be very difficult to break down barriers to learning that may be present. In fact, we may actually create more barriers to learning and family involvement instead of encouraging learning and family involvement. What we may need to do is educate the families in a non-confrontational manner, making them our allies instead of our enemies. Only through reaching out in understanding and tolerance to those of different cultures than our own, can we successfully educate our students. Not only do children bring with them the cultural and structural differences of their families into the classroom, they also bring with them the problems of the family. Some children are in such extreme poverty and neglect that the only meals they eat are the ones at school [Schwartz, 1995; Clearinghouse on Urban Education, 1995]. 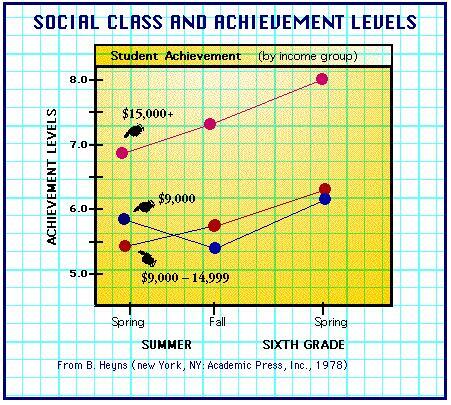 In fact, Heynes (1978) reports that income is a significant factor in predicting academic achievement. Other children live in families in which substance abuse is prevalent in the home. Yet others are victims of physical, sexual, or emotional abuse or neglect. There are also those children who are left to raise themselves due to both parents working. Some children are required to care not only for themselves, but for sick parents or siblings. They may have had to leave the house due to a parents or guardians abusive behavior or may have been kept awake all night by parents or siblings fighting. Due to these situations, students may not get homework done, they may not be able to perform well on classroom assignments or tests, or may fall asleep in class. Those of us who work with these students must have an understanding of the family dynamics in order to help to educate and bring hope to these children. A childs attitude towards education may be shaped by his parents or guardians attitude towards and level of education. In some cases, parents or guardians may be illiterate (Schwartz, 1999) or have very little education, and therefore do not see the importance of their charges doing well in school and furthering their education. They may not understand why it is important for their children to take algebra or a foreign language. Although the student may receive support and positive reinforcement at school, many times that same support and reinforcement is not to be found in the home due to the lack of awareness on the part of the parents. Once again, we must make parents our allies and reach out to these families, instead of appearing intimidating and disrespectful of their views. As was previously stated, more schools and school systems are finding that in order to educate a student and break down barriers to learning, it is necessary to reach out to families and do all possible to involve and educate these families (Funkhouser & Gonzales, 1997). There are programs being implemented throughout the United States and Canada that are finding positive results and improvement in student performance in schools. Our challenge is to see the student not only as a receptacle for learning, but as a whole person who has been shaped by the family surrounding him. In order for these students to be successful, it is imperative that we reach out to and get the families--no matter what definition of family one chooses--involved in the education process. [e.g., U. S. Department of Education, 1998]. McCarthy, A. (1992). The American family. In L. Kaplan (Ed. ), Education and the American family. Boston: Allyn & Bacon. Websters New World College Dictionary (3rd ed.). (1997). New York: Simon and Schuster.